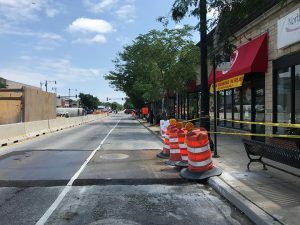 A plan to provide parking relief for Downtown Edgebrook businesses during the final months of a sewer project was recently implemented, according to aldermen Margaret Laurino (39th) and Anthony Napolitano (41st). Construction crews recently narrowed their workspace to allow for about six parking spaces for at least 30 days on both sides on Devon Avenue between Central Avenue and Kinzua Avenue, said Laurino spokesman Manuel Galvan. Merchants have complained that road closures and parking bans have crippled the business district for months because shoppers are avoiding the area the due to traffic congestion and a lack of parking. Efforts also are being made to allow free parking in some of the metered spaces in other parts of the business district during the construction, Galvan said. In addition, the aldermen and state Representative John D’Amico (D-15) reached an agreement with Metra to allow free parking on the west side of Kinzua from 6 p.m. to midnight weekdays and all day on the weekends (no overnight parking) during the remainder of the sewer project, Galvan said. Metra normally charges $1.50 a day to park there. Laurino and Napolitano also are planning to send fliers to area homeowners encouraging them to patronize local businesses, according to Galvan. The fliers will include a list of the businesses, he said. Meanwhile, merchants will hold a “Save Our Shops Block Party: Edgebrook Takes Back The Streets” on Devon from noon to 6 p.m. Saturday, Sept. 1, said Everyday Edgebrook treasurer Laura Guenther. The $5 million sewer project recently hit a snag when a construction crew struck an unmarked fiber optic cable under the railroad crossing on Devon. While the cable is being relocated, crews are continuing with some portions of the sewer project, Galvan said. The project is scheduled to be done in November, but after the cable’s relocation is completed, project officials will be able to give a better assessment as to when the sewer work can be finished, said Napolitano’s chief of staff Chris Vittorio. At the beginning of the month Devon was closed at the railroad crossing for repairs but is now open to traffic.